Rapper 50 "Fiddy" Cent raps about masturbating into condiments in his burger-flipping days in such lyrical bombs as "My burgers sizzle / and that's the shizzle / and I'm a straight-up jizzle / in yo' mayonnizzle". Armando Perentie yesterday. "You expect me to lay out a pretty-looking page with these claws? Get stuffed," he says. Drongos just became an endangered species. "GO ON - GIVE THE FERRET A RUN!" 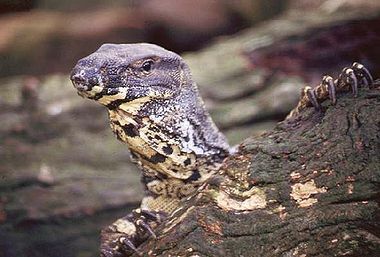 Armando Perentie is a large, docile goanna from south-eastern Australia. Other than basking in the sun on warm, toasty bitumen, drinking beer and wasting time here, his interests are few and equally pointless. He is also the founder, chairman, chief executive, chief correspondent and editor-in-chief of the Goanna News Network, a niche news operation with correspondents in Melbourne, Pakenham, Pakenham Upper, Alice Springs, Canberra, Cardiff, Beirut, Ballarat, Beijing, Damascus, Islamabad, Mindanao, Mexico (Day Effay), Washington (Day Effay), South Yarra and Arkham, Massachusetts. Tintin never actually set foot in Cambodia because Pol Pot and the Khmer Rouge took over the joint two days before he was due to visit for a holiday. UnNews:Freddie Flintoff: "Smoke 'em if you got 'em"
UnNews:Chris Isaak not sure about all this talk about "San Francisco values"
UnNews:Prince Charles: "I say! Pakistan's a bit of a rum show, wot?" UnNews:Google, Yahoo! join forces to combat "lol fraud"
UnNews:Welshman sick of people using the word "welsh"
I used to waste my time blogging at Roadkill Goanna but I don't any more. It was stupid anyway. On your knees, worthy one! The Right Reverend Major Sir Zim_ulator blesses you. This user is a Marree Man. Drongos just became an endangered species. Passive smokers should piss off and buy their own. This page was last edited on 29 June 2012, at 05:24.